It was a weird weekend. I'm still feeling weird. If I had found a psychologist I liked in Joburg, I'd be booking an appointment ... just one of those get all the stuff swirling in my head said out loud and see where to from there kinda appointments. (If anyone wants to recommend a female psychologist in the Joburg North, Sandton/Rivonia/Bryanston area in the comments, I'd appreciate it. Or drop me an email). Yes, I have a lot swirling about in my head. A lot. So, anyway, aside from that, I popped over to The Trucker's for dinner on Friday night. We ended up getting Chinese take-out. It's the first time I've had Chinese food since I was in China. To say it was a let down would be an understatement. I can't believe how all the same Chinese restaurant menu's here are (we went to another Chinese restaurant for sushi on Sunday night). My Cashew nut Chicken with noodles was still tasty. But I expected something more, or different, or I don't really know what. 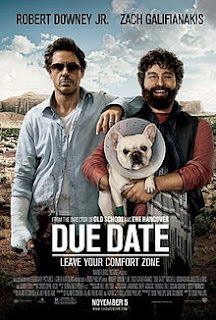 We watched Due Date. I think we both just needed a quiet night on the couch. 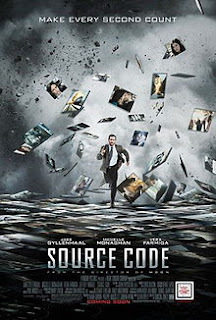 I wasn't super impressed with the movie (probably why I hadn't watched it on big screen). I do adore Robert Downey Jnr tho. But this just felt like one of those ridiculously annoying towards the end where everything that can go wrong still is going wrong. 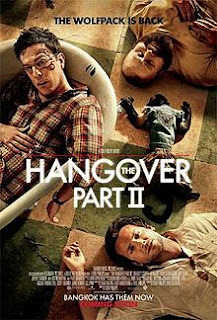 There is only so much of that I can really put up with in a movie (which is why I generally struggle with things like Meet the Parents and The Hangover). On Saturday I had a very lazy morning, went for a walk and then headed off to lunch with some of our old Bookclub friends at TSG. It was great fun catching up with them all because I don't think I've seen some of them at all this whole year! And an afternoon of pasta & wine was ideal for the icy day. Later The Trucker & I headed to Red Room with some of his friends, which was fun. Although I apparently drank a little too much (see, this is why I should drive to RR, cause then I drink nothing but water. Apparently my tolerance for alcohol has dropped significantly!). 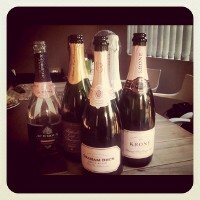 Which meant Sunday was less than stellar. I meant to do stuff while he was off playing cricket. Like catch up on Holiday blog posts and watch Xmen (he doesn't want to see it). But those things didn't really happen. In the afternoon we hung out on his couch again and watched The Thomas Crown Affair and had a long afternoon nap. And then went to have sushi for dinner. All in all a pretty blah weekend. *Yawn* Oh my word. I am tired this morning. Which is fair enough since I was up at 2am when I heard a noise outside from the bunny hutch. After peeking thru my window and seeing Coal & Lily both out of the hutch and in their grass enclosure, I headed outside to put them back inside. But that wasn't happening. Something was very wrong. I still have no idea what happened. But there was absolutely nothing that was going to get them to go back into their hutch. Their ears were pitched forward, nerves all on end, thumping. Rex raced out too once I opened it fully. I headed inside for a torch. There was nothing inside their hutch to scare them, but something had them spooked in a way I've never seen before. So I wasn't going to force them in there ... instead I waited around while Coal & Rex slowly and cautiously inspected the entrance again and again. Running away in a panic when they got too nervous. Thankfully eventually Rex went inside all on his own. And I managed to easily pick up Lily and Coal (which for Lily is a *huge* indication of how she must've been feeling because that is a rare occurrence, for sure) and placed them in the hutch on the top level. They explored a bit after that and everything seemed fine. All is fine this morning too. Sigh, poor things. Poor me. I did not get back to sleep properly after that again. Yawn. And other than that, the week has been pretty normal. Went to SCM on Monday night and played Action Cricket for the first time in about 3 years (since I left The Big Corporate) last night. Which was good fun, and I got to see The Trucker for a little bit because he had a later game than ours. Poor boy has not been well this week. Shoo. Yep, I was spot on about that busy week! On Wednesday evening I headed off to The Trucker's. We got take-out Steers and went and sat on the first fairway of a golf course to watch the Lunar Eclipse. I won't lie, it was *freezing* outside. But it was awesome to cuddle up on a blanket and watch the sky. The moon was unbelievable. Honestly I didn't really know what to expect, and it was well worth it. We came inside at about 22h30 after the moon was entirely red and kept peeking at it from the balconey to watch how dark it eventually got. While we were there, and that was partly why we were there, I popped across to the vodashop next door and sorted out my contract upgrade. 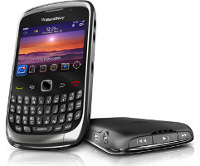 You would think I'd be more excited about a new blackberry, but I was very nonplussed. Until that evening after I *eventually* opened the box and set the thing up. I adore it now. It's shiny and new and so much faster. I am loving it so far :) Haha. I got the 9300. Nothing so fancy as the Torch because I still can't justify how expensive these phones actually are, although I've now come to admit that I definitely need one. (The only thing I'm not thrilled to bits about so far on this phone upgrade is the camera. Everything else is definitely miles improved on my old 8900). And then I rushed off home to clean my kitchen and make a Spinach and Feta Free Form Pie for lunch. I had Louisa, Ruby, Arkwife, Jackson's Mom and Doodles over for a catch-up lunch. In our new tradition, everyone brought a plate of food and a bottle of champagne :) (Photo shamelessly stolen from @Rubyletters :) ) What a lovely way to spend an afternoon and the food was delish (definitely ate too much!). And I'll be honest, there's nothing better than a group of good friends to set you straight when you're being completely irrational about life :) Haha. The Trucker popped over for a visit (and to finish some of the left over food from lunch) later and helped get the new bb all set up. Clearly this would be where my recent brain-wobble lies. I realised this week how much baggage I clearly have after all these failed relationships. Seriously, I did not see this coming or how I'd be affected, I've honestly never noticed it before. For the first time in my life I have this weird panic reaction where I actually find myself rationlising running away from this and ending it and being single again because it's scary not being entirely in control (and I think it's getting harder as I get older!) and it feels like it would be so much easier. But I don't want that either. And I guess that is *actually* the scary part. Sigh. Shoo so even tho this is only a 4 day work-week, it's social completely jam-packed! Mom arrived in Joburg yesterday evening for 2 nights with me en route to Chobe & Vic Falls (how cool!). Afterwards I gave her, her gift from China along with The Peeb's and Daddio's to take back to Cape Town with her after her trip :) And I showed her the updates to my photo wall. Yesterday seemed like a very long work day before I could go home and hang out with her again. And while I was at work she made dinner and dessert :) Macaroni Cheese and Cheesecake. So, The Trucker came over for dinner as well. Was an awesome evening, really. And then an early morning to get us both ready to leave at 06h30. At least tomorrow is a (super-busy, no-time-for-resting) public holiday and tonight is the Lunar Eclipse. Yep, life continues at pace. 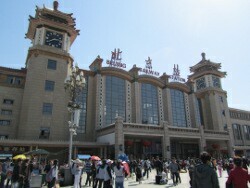 Our train got into Zhongwei this morning at about 09h45 and we walked to our hotel, Hua Ming. Luckily we could get into our rooms and have a shower before heading out for a walk around the area and some lunch. We ended our walk outside the Gao Temple, which we all wanted to visit because we'd read that they've built a house of horrors in an old bomb shelter under the temple! The Temple itself was gorgeous and worth the visit regardless. You get to climb up into the higher roof levels and they have such great painted stories all around. 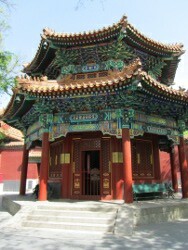 I far preferred it the Lama Temple in Beijing. 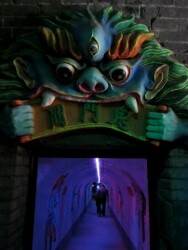 And then we got to the house of horrors bit which was *most* peculiar. Quite dark with lights and sounds that went off on a sensor. And it was quite cold underground. Mostly it was all just these weird kinds of torture scenes in luminescent colours! 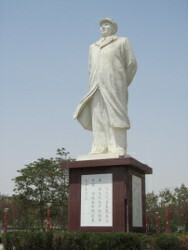 And then, just when we got back to the hotel for a little relax, we bumped into our Tour Leader who was about to head off on a walk to the Yellow River. So we went along. It was *far*. Out of the area of town we'd previously walked thru, to an area that looked much newer. As with all of China we've seen so far, loads of new billion storey apartments blocks are all going up at once. The construction here is on a scale like I've never seen before! The Yellow River really was not that impressive at all. We decided to get something to eat at the local market on our way home, but they weren't yet ready for the dinner crowd. We did have some nice dumplings with pork filling tho. And then we headed back to the hotel for a bit of a rest. Actually, on the way back we stopped and bought some more street-food: like a weird sweet batter thing they were cooking. Not too bad. And to ensure we got our dose of surreal for the day, we also saw a guy with 3 monkeys on a leash walking down the road past us! Then we had about an hour's relax before heading off to dinner and a birthday drink for our Tour Leader (it was his 30th today!). He taught us a dice game, called Liar's Dice, too. Good fun. Had a relaxing morning at the hostel today (Luckily I repacked all my bags last night - what a mission!). Had breakfast at the hostel too (figured it should be done once). Delish Mango juice - have had such a craving for fruit juice recently! And the most amazing amount of French Toast I've ever been served! And each slice was like a triple-decker French Toast too. I was quite ill by the time I gave up - haha. Quick stop at a local shop for some Instant Noodles (take note, after the novelty in Mongolia, these will become a theme of train-travel in China!) and we were ready to go. We took the Metro back to Beijing Central Station, where I'd arrived only a few days before and boarded a train for our 22hr ride to Zhongwei. 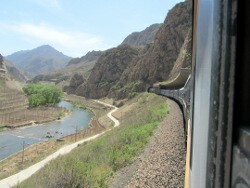 The train was a lot more cramped than the Trans-Mongolian one I was on. This had 6 beds per cabin and no doors. Thankfully we managed to all switch into the same cabin, which definitely made the journey easier for us. And off we set, on the same train track I'd come into Beijing on (it's the same route till DaTong Station where we split off). Was certainly not as nice a day for photos out the train and none of the windows opened at all. Had Instant Noodles for dinner. Very exciting :P And then slept for most of the journey. It was a lot noisier tho and the guttural throat clearing as if people are about to throw up is just not something I'm getting used to! And then we arrived. They have a cable car option, or you can take the stairs up the side of the mountain. We took the stairs (Apparently there are about 800 or so). Although, the stairs don't end there! 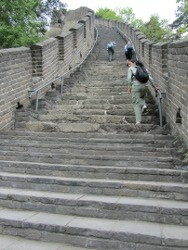 The section of the wall we visited (Mutianyu) was pretty much all stairs! Still, it is vast and incredible to see. And my mind still boggles at the mere concept of it. I guess it is a bit like the pyramids & Machu Picchu like that, this amazing grand-scale thing built however long ago. I guess tho there is an element of us still doing that with super tall buildings (like in Dubai). 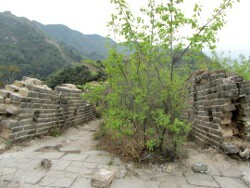 We spent a while walking down one stretch of the wall till it got to a bit that hasn't been restored and then back to the entrance we came in. It does all get pretty much the same after a while and exhausting because of it's sheer size. Still, it was awesome to just find a spot to contemplate the unique view for a while and try and picture how it must've been while being built or to come across accidentally. We were not so lucky (or maybe we were?) with the weather. It was overcast and misty which was great cause of all the over-exertion, but not ideal for long-distance photographs. I was also very pleased we went as early as we did because it was quiet for us, but we passed plenty of people as we were heading back. After lunch we drove back to the city for our foot massages (this was all part of our day-tour). It was more like reflexology really and some bits really hurt! But it was fabulous. I'm pleased to report that my feet and ankles haven't given me any issues today (even with all those stairs on the Wall!). And then it was back to the hostel. The weather was quite chilly and it was raining on and off all afternoon. I've found using their metro really easy (2yuan per trip - that's pretty much R2!) Although they've been standing room only every single trip I've done! I do find myself contemplating their 1-child policy and noticed I didn't see a single pregnant woman in Beijing. Plus I do find I kinda wanna go up to every parent walking around with a girl-child and high-5 them! Haha. I've learnt that the 1-child policy came into being in 1979, so just before I was born! We chatted about it quite a bit with our tour leader and apparently it doesn't apply to any of the minority groups in China. Also in some rural areas you are allowed to have a 2nd child if your first is a girl. Also, I heard that they were considering changing it to allow you to have 2 children if both parents were single children. Very interesting. And to say China feels crowded is an understatement. I wonder what it would've been like without the policy. Plus I wonder what effect a generation of sibling-less children has had. They say that the reason that the Chinese all push to the front of queues and whatnot is because there are so many people and you have to look out for yourself and your family first. It's definitely an interesting social study. We decided that as a last thing in Beijing we'd go and see The Bird's Nest, their Olympic Stadium. It was pretty boring, honestly. We got out the station, took a bit of a wander closer, took some photos and turned around and came back. It was also super foggy and misty. Oh, and it was the *one* time there was plenty of space on the train (it's on a line of only 4 stations that I gather were mostly centered around Olympic stops). Haha. Well, what I can tell you is that 2 days in Beijing is no where near enough. Especially when you spend one full day at The Great Wall (on our schedule for tomorrow!). Anyway, so back to the fun stuff. Went for breakfast at a little bakery across the road and got a Mango Smoothie and a triple-decker breakfast-type sandwich. Not sure what all was on it besides egg, but it was delish! 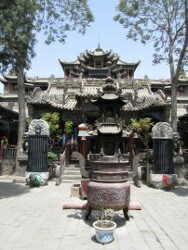 And then we all went for a quick orientation walk, which ended at Yonghegong Lama Temple. So we went to have a look around in there. It was way bigger than I was expecting. The architecture is quite lovely, but all quite the same (since I wasn't really there to be lighting incense and praying or whatever). 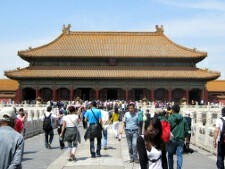 After that we walked from our hostel to The Forbidden City. Which is more of pretty much the same style architecture again, but on a much larger scale!! 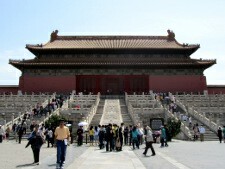 The Forbidden City is massive and I can't even imagine living there back in the day. It must've been beautiful (since it still is, but you'd have time and way less people). It was quite interesting to see a few of the rooms as they were then and learn a little more about the lives of the Concubines. Eventually after we'd walked The Forbidden City North to South, we came out at Tiananmen Square, right under the giant portrait of Mao! We didn't get to go into his mausoleum tho (it's only open 8-12). We wandered around for ages trying to find somewhere to have lunch but, we weren't quite brave enough to try a local restaurant on our own. After a quick snack stop at a supermarket, we headed to the Hongqiao Market (The Pearl Market). Which I didn't really enjoy. A lot like China City back home and I'm not really looking for bags, clothes, shoes or watches. Nor am I that interested in jewelry with pearls. But, I did really enjoy the souvenier bit ... although I didn't buy anything yet. And then we hung out at the hostel for a while, I rested my ankle and then we ventured out to the Night Market on Wangfujing Street. That was completely one of the best things I've done here, such fun! And my ankle was pretty much fine too (awesome news!). 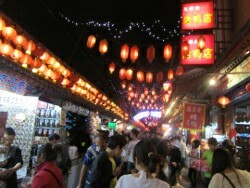 The Night Market was a hive of activity and stalls. Plenty of weird foods that I wasn't brave enough to try. 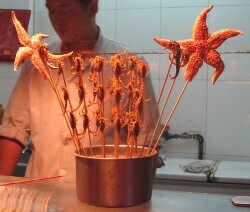 All number of creatures on sticks: scorpions, starfish, seahorses, spiders, lizards and baby birds. I did have some shrimp that was delish and a veggie spring roll. 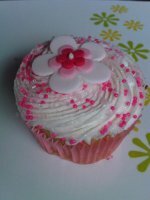 There were also loads of souvenier type stalls and I got something there for mom (which I ended up keeping for myself! Haha). 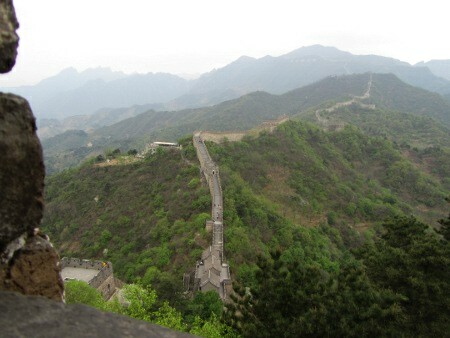 Had set my alarm quite early this morning (06h45) in the hopes of catching the first sight of The Great Wall. But I was quite exhausted due to lack of sleep the night before (and I did not sleep well at all in those 4 hours) and the blinding morning sunlight meant I didn't actually see it, although I did wait up with high hopes. Eventually I went off to use my breakfast voucher, which provided me with 2 slices of white bread, 2 boiled eggs (in their shells) and some butter and strawberry jam with revolting tea (as you probably already know, I am not a great fan of tea in general). The view really isn't what I expected. So far China seems very industrious. They are building and planting and farming en masse, in what appears to be a very organised fashion. After that it was pretty much just waiting around watching some of the most gorgeous mountain scenery till we got to the outskirts of Beijing. Seriously now tho, I am sick of going thru tunnels on a train - haha! There really is an absolutely unbelievable number of them thru the mountains. And then we got to Beijing station and it was goodbye to Rat and @nctift as we all went our separate ways. I headed off in search of an atm and then was very lucky to find a girl I recognised from the train (another carriage) who was luckily an experienced traveller to China and knew how their Metro system worked - very lucky for me because although it really is easy enough, it would've been very tricky to figure out alone with no Metro map. Thankfully just about everything is duplicated in English since the 2008 Olympics. So, with a quick Metro trip (involving 1 line change), on one of the busiest trains I've ever been on in my life (it's like every single train is rush hour!) I made my way quite easily to 9 Dragon House, my Intrepid tour joining point. Oh, and was I ever thrilled to pieces to get into my room and have my first shower since the morning of my birthday!! And yay, the hostel has free wifi to keep me entertained while I wait for the Introductory meeting. We have a local tour leader and the whole group is just 4 girls. 2 who are friends from the UK, an Australian from Melbourne and me. After our meeting we went just around the corner to a local restaurant for dinner. Apparently Peking Duck is the speciality in Beijing, so naturally we all wanted that! We let our tour leader order for us. In traditional Chinese style, we ordered a number of dishes for the table and all got to taste them (that lazy susan is there for a reason! Who knew?). We had Peking Duck, Chili & Aubergines, a peppery Beef dish, garlic Asparagus and then Lotus Root with a Blueberry sauce. So, we're in Mongolia. 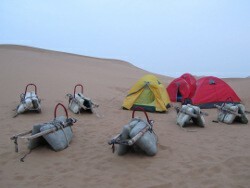 I thought that would make this a more exciting day but, so far Mongolia hasn't made a very good impression. I'll admit I was unprepared for the complete desolation of the place. Seriously, there has been nothing but sand since I woke up. On the plus side, I did spend all my remaining (not part of the collection) Togrogs on some Instant Noodles. Somehow it is easier to barter when it really is all the money you have to offer. But at least I've eaten since my borscht at lunch yesterday. Although the urging has come more from my brain than my stomach. Sitting around on the train exacerbates my desire for snacking! I have continued to sleep my way thru most of Mongolia, occasionally popping my head up to see if the view has changed at all. It never did. Desert on both sides. Even the towns weren't particularly interesting. We briefly got off for a walk at Saynshand station and then headed to the Restaurant Carriage. Although they have a much bigger menu than out Russian Restaurant Carriage, they seem to have little available. So it was beef with cheese, which came with some rice, potato, cucumber, tomato and carrot salad. Not bad, quite oily like the Russian food but, I'm also pretty sure it wasn't beef. My money is on Horse or Camel? Anyway, that and a coke cost me 10USD (I had specifically taken USD for spending on the train after Russia since I figured I wouldn't have any local currency). And so, our Mongolian experience was about done. Can't say that anything I've seen, just passing thru, would make me inclined to recommend the place to anyone tho. 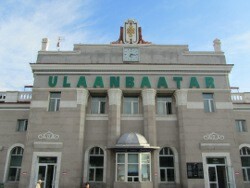 We weren't even let off the train at our Mongolian border stop at Zamyn Uud. But, on the plus side I could get Chinese signal on my phone. Clearly Vodacom does not have a roaming agreement with Mongolia because although it connected, I only had SOS signal all day. 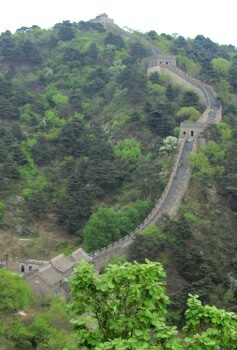 And then we crossed over into China at Erlyen. They were very efficient with out passports. And all the forms were, thankfully, in English for us. Everyone seems skeptical when comparing me to my passport photo. How odd. Guess it's lucky I'll have to get a new one soon. We got given free breakfast and lunch vouchers for the Chinese Restaurant Carriage, that was a surprise. I wonder if it is because we haven't had a chance to change any money yet? We got to watch the Bogie-Changing, which was pretty cool. They drive the train into a massive shed and then separate all the carriages and lift them all up and slide the old wheels out from under them and then slide the new narrower gauge ones in. 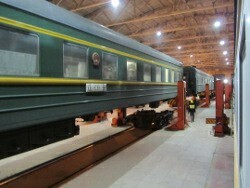 And then they re-lower and reconnect all the carriages. We were done pretty quickly with the process but still had to wait around till our 1am departure time (gotta keep the train on time, I guess). We met a nice American guy who'd got on the train in Ulan Bator, @nctift, and ended up all swapping travel stories, drinking a bottle of Vodka with coke until after 2am! Omg. I am still suffering terribly in this cold. Seriously, I feel like the opposite of a Vampire, I'm only well when the sun is out :P Urgh. And my house is a freezer, last night I was in bed under my duvet with socks, tracksuit pants, a scarf, a jersey & a beanie ... all with the heater on and it was only just bearable :P *sob* I hope things icy-cold-wise improve soon. That said tho, my phone weather app tells me we've got rain coming Tues & Wed this week - wtf is that about?! It's Joburg in Winter, we can't have rain! Anyway, so the weekend. On Friday we shuffled around our office space again, now that our additional space has finished being built (yay, no more construction sounds!). And I'm pretty happy with my new spot so lets hope that helps. On Friday evening I went to The Trucker's and we just had a quiet evening watching series. On Saturday morning we had breakfast and a lazy morning. On Sunday I wasn't feeling well, I think my tonsillitis has gone but now I have a cold. Urgh. I never get sick, what on earth is this all about?!?! Anyway, we out for breakfast and surprisingly ended up at Wimpy (since the restaurant we started out at seemed completely uninterested in actually serving us, so we got up and left), which turned out to be quite nice and in keeping with last night's theme - haha. Can't remember the last time I actually had a Wimpy breakfast! Alex kept the secret of his childhood, even from his loving wife and children. But he grew increasingly tormented and became determined to uncover his Jewish roots and the story of his past. 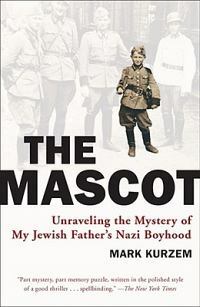 Shunned by a local Holocaust organization, he reached out to his son Mark for help in reclaiming his identity. A survival story, a grim fairy-tale, and a psychological drama, this remarkable memoir asks provocative questions about identity, complicity, and forgiveness. 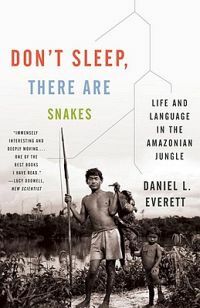 Well, this book would be fascinating even if I didn't happen to be vaguely near the area it happened in. Although the forests we've been travelling thru have certainly fueled my imagination. I have said before that I adore books (and movies) that leave you wanting to scour the internet, searching for more information and this along with the next book I read on the Trans-Mongolian train have both inspired exactly that reaction in me. This book is fascinating although I didn't always like the way it was written. I would highly recommend it. I loved that it included photos and although the story-telling was always interesting and I did struggle to ration my reading on the train, I found I wanted there to be more factual investigation alongside. Anyway, again, an unbelievable life story and I think you should read this! Didn't sleep very well last night. More just dozed on and off. I suspect it's down to our life of doing nothing and dozing thruout the day. Either way, I was vaguely aware of the noises at our Irkutsk stop, but I didn't get up till about 05h30. Ah, what a divine surprise awaited us! The world is covered in a thick white blanket of snow :) Suddenly the view was a huge novelty again. In fact, the view changed more today than in the last few days altogether. And on top of the novelty of the snow, we went thru 2 tunnels (didn't get a photo tho because I ran out of battery and the 48V plug-points in our carriage are pretty useless!). It was a long wait for the restaurant carriage (still on Moscow time) to open up! 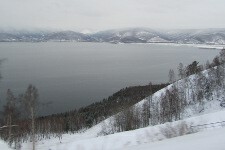 But I did manage to get a few good shots of Lake Baikal as we went past. And then it was back to bed for more dozing. It was kinda nice having a morning of winter train travel but, soon they'd cranked the heat up to an unbearable level and I was standing next to the open window for some fresh air. I never understand why people would make somewhere hotter than necessary. It's so much easier to get warmer, but not so easy to cool down! 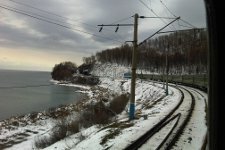 We stopped at Ulan-Ude and after that I went to charge my camera battery in the Restaurant Carriage and have some Borscht. Have I mentioned how lovely Russian graveyards are to see as we pass by on the train. Sadly I haven't managed to get a decent photo. I think the most gorgeous one I saw was the one covered in snow this morning. 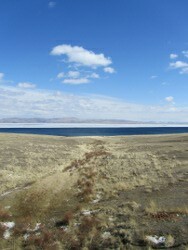 We rode past Goose Lake which was almost frozen over. It's nice to have seen more life around today, more people and animals out and about. Their dark wooden houses remind me of Gum's cottage. Now we've stopped at Naushki, the Russian-Mongolian border town and we're waiting to get our passports back. Unfortunately there are no food shops at this station and not even people trying to exchange our money. Was hoping to get some Mongolian currency for my collection on this trip. Oh, and we've been given 2 identical customs forms to complete, but they're entirely in Russian! It is surreal considering the Chinese (I think?) conductors seem to speak no English or Russian either. We're just lucky to have an American on our carriage who knows Russian. Well, wait ... wait ... wait. Showee, the Russian border process is tedious! They must've traipsed at least 15 individuals and 3 dogs thru out carriage before we got out passports back. And then we hung out longer at the station (just for fun?). 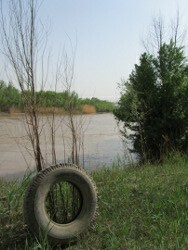 And eventually we got to the Mongolian side of the border crossing. They seemed slightly more efficient than their Russian counterparts but did re-check our entire cabin. I was kinda impressed cause the Mongolians were the only ones in my memory to actually try comparing me to my photo in my passport. We've just had about 20 official looking Mongolians walk thru our carriage. Sigh. And we get to do this all again tomorrow evening. At the moment I'm just feeling kinda peckish (thought there'd be something to buy at our lengthy Russian border stop and the Mongolian Restaurant Carriage only joins us in Ulan Bator) and in desperate need of the loo! The lock the carriage toilets at all the station-stops and this time they've been locked since we got to the Russian border town, 6hrs ago!